It's been a busy summer so far. I've finally put the paintbrushes down long enough to tablescape. Yippee! Plain wooden napkin rings from Michaels. I adhered a starfish to each with a pop dot. The blue chargers, from Lenox, were purchased inexpensively at a consignment shop. 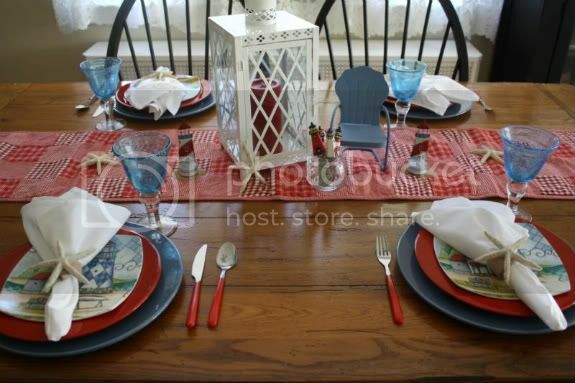 The red dinner plates are from Pier 1, many years ago. 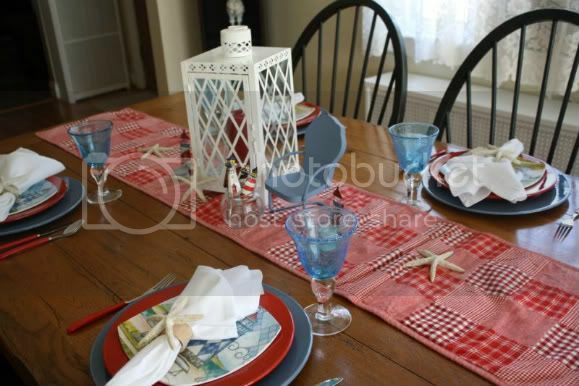 Lighthouse plates & blue bubble goblets are from Christmas Tree Shop. Lighthouse tea light holders from Christmas Tree Shop. I can't remember where the lighthouse spreaders came from or the metal chair...I've had them forever. 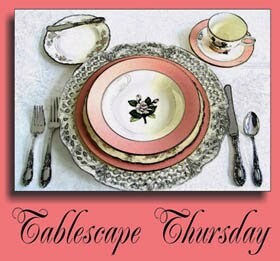 Joining Susan's Tablescape Thursday at Between Naps on the Porch. Thanks for stopping by my blog today. I really appreciate your taking the time to visit me. Gina - that is sooo cute! I really like your blue stemmed glasses and the square lighthouse plates. You did good! Now get back to painting! ... awww I'm just kiddin! Actually you deserve a break. Put your feet up and have a tall glass of lemonade or refreshing iced tea! I love it Gina!! 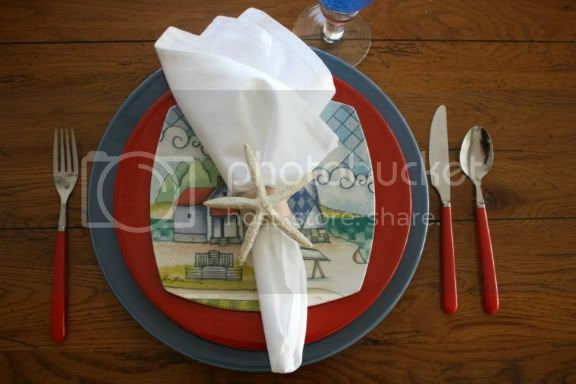 I like the blue glasses, the sea shell napkin rings,,the top plate with the light house!! Love it all!! Whats for dinner!! Have a great day! LOVE your red flatware. I have been on the look out for blue but can't find any that's affordable. Great job. Super summery tablescape Gina! Love it! This is just adorable. I love those plates!! Spreaders and that metal chair are soooo cute. And your glasses are beautiful--can't wait for our Christmas Tree Shop to open, I hear it's coming soon... thanks for sharing, gorgeous!! 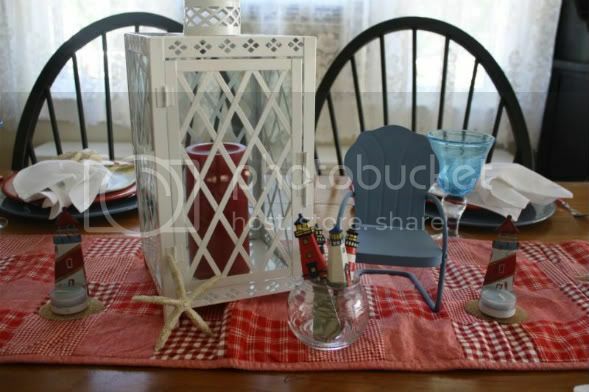 Our minds were together on a nautical tablescape. Love the lantern,little chair and dishes. Stop by for a visit. I love your tablescape. It reminds me of great times at the beach. I'm a big fan of the Christmas Tree Shop. You can find really cool things there. How cute Gina! Love the centerpiece and cute dishes too. You have been busy too these days! How adorable! I love the lighthouse spreaders and the little lawn chair in your centerpiece. So summery. Wonderfully summery table!!! I am a big fan of lighthouses! This table is a wonderful endorsement of summertime R&R! That tablescape is adorable Gina! I love what you did with the napkin rings! Very summery looking! I love the theme of your tablescpe! It's so pretty and cheerful! Gina, this is so cute and bright! 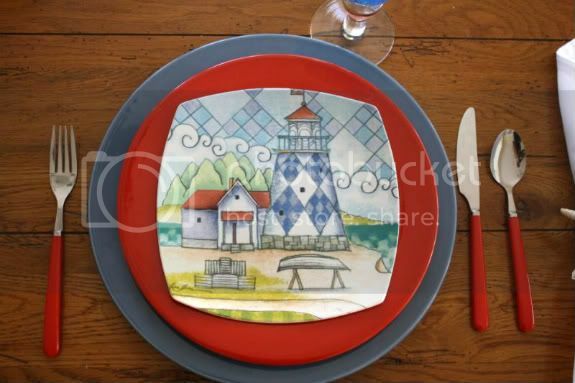 I love this color scheme, and the lighthouse plates are charming! Lucky you, to have that pretty red flatware! Thank you for visiting my table this week! Gina ~ it looks fantastic!! I am glad that you are still embracing summer ~ Gorgeous! Your tablescapes are always so much fun. Love it and love the little metal chair! Too cute. This a fun summer table. Love the dishes and your little chair on the table. Thanks for your sweet visit this week as well.